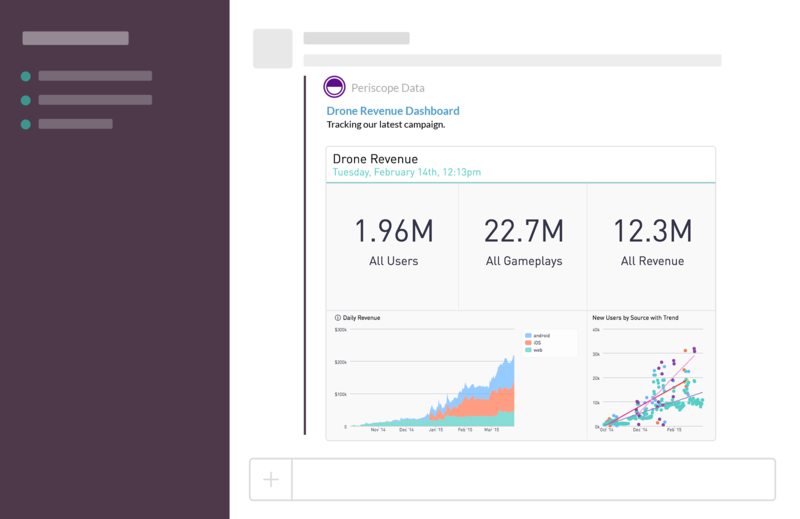 Sharing Periscope Data links in Slack just got better. Install our Slack app and beautifully formatted previews will appear when you share Periscope Data reports and dashboards. It’s not magic, but it might feel like it. You can install our Slack app and rest easy knowing we won’t share information from your Periscope account with restricted access. Anything shared that falls into this category will still include a message preview, but will only include the name of the report or dashboard. Sensitive data will not be included in the message preview. Below is an example of how a link with restricted access will appear when shared. Periscope will unfurl charts and dashboards posted in Slack channels that the Periscope Slack app can access. To allow unfurls in additional channels, invite the Periscope Slack bot @periscope to the channel.